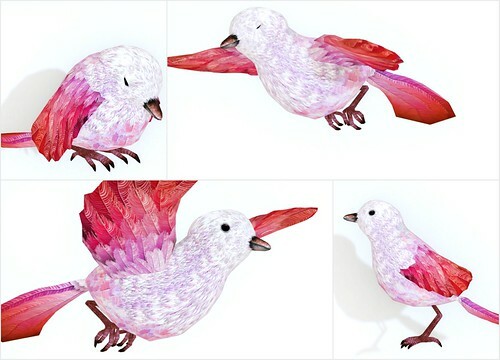 The LOLO Pet Shop has just released these adorable tiny Mesh Birds, and they’re just my kind of pet in SL. These birds do not need to be fed, they don’t need attention (petting, playing), and you can’t even breed them! Just buy one bird, or a few birds (if you want to collect all the colors) and watch these lil’ darlings fly around you OR set it to perch on top of your shoulder. The LOLO Mesh Birds is scripted with these functions: follow fly, follow walk, roam small, roam, roam large, fly, sleep (reset), chill, walk, rename, and name display. These birds have transfer permission only, so they’ll make a great gift but you’ll have to be careful not to lose them! Watch the official LOLOPetShop YouTube video to see this bird in action! Visit the LOLO Pet Shop! what are the scripts like on them?